Because each user review counts. Consumers who are on the hunt for the best credit card in Canada have a lot to consider. We take over 50 different card features into account when giving you a credit card’s Genius Rating. However, short of owning every single credit card on the market right now, there is no way for us to tell you about the approval process or customer experience ‒ and those things matter. The award for People's Choice is given to the card that you "voted" on ‒ using a 5-star rating and review. Each time you leave a review for a credit card that you already own (or cancelled), you’re essentially voting for the creditcardGenius People’s Choice credit card. 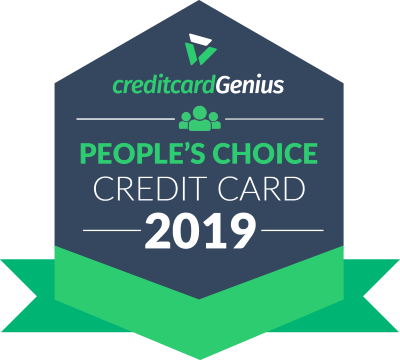 Our People's Choice credit card for 2019 is awarded to the card with the most – and highest rated – user reviews, regardless of its assigned Genius Rating. And with more than 10 reviews averaging at 4.7 stars, the is the clear winner. In 2015, a study was done that showed that 67% of consumers are influenced by online reviews ‒ and 55% of consumers admit that "online reviews are either fairly, very, or absolutely an important part of their decision-making process." Credit cards are no different. People don’t want credit card shopping to be a guessing game. Why else would online personal finance communities that talk about credit cards be so popular? There are some who value consumer opinion more than they do the actual product features and shiny benefits offered on paper. Was the card easy to apply for? Did it take a reasonable amount of time to find out whether or not you were approved? Is the plastic flimsy, making the card easy to damage? Does it take forever to get through to customer service? Is your monthly credit card statement accurate and free of errors? Has your credit card company ever gone above and beyond for you? Is the online banking experience a good one? The bottom line? Only you know what your personal experience has been like with that credit card. That’s something no one else knows. So, why not share your experience so you can help others make the Genius choice when choosing their next credit card?